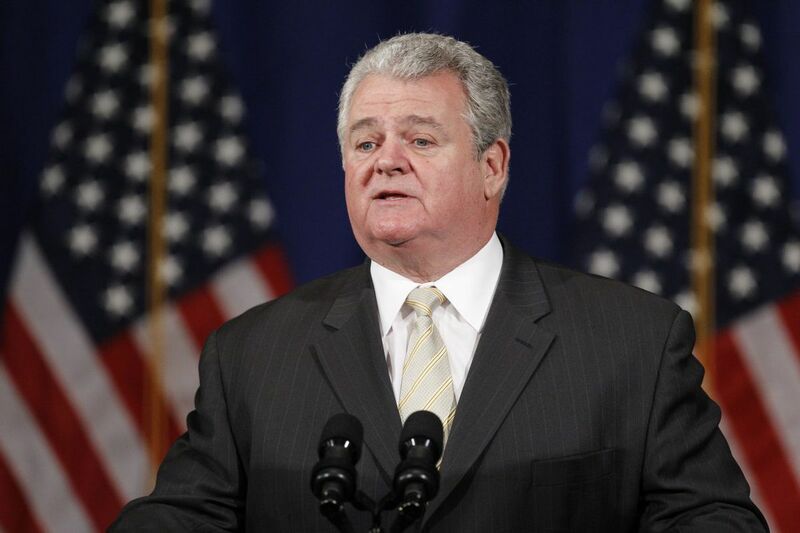 Federal prosecutors said Tuesday that U.S. Rep. Bob Brady's campaign secretly paid a 2012 primary rival $90,000 to abandon his race and that the city's longtime Democratic power broker later tried to derail an FBI investigation into the payoff by coaching a witness. Those accusations, in court filings made public for the first time, emerged with the disclosure that an aide to Brady's challenger, senior Municipal Court Judge Jimmie Moore, had admitted her role in the payoff scheme and pleaded guilty to conspiring to conceal it. Neither Brady nor Moore has been charged with a crime. Nor were they identified by name in the court documents that outlined the plea by Moore's former political aide, Carolyn Cavaness. But a news release from the U.S. Attorney's Office in Philadelphia about her guilty plea made clear the crime was related to the 2012 primary campaign for Pennsylvania's First Congressional District, which Brady has represented for nearly two decades. Under wraps for at least months, the case suggests that Brady — chairman of the Philadelphia Democratic City Committee since 1986 and the second-longest-serving U.S. representative in the state – may be the city's latest major officeholder under FBI scrutiny, less than a year after a former House colleague, former Rep. Chaka Fattah, was sent to prison for corruption-related crimes. Reached for comment after the filings were unsealed late Tuesday, Brady referred a reporter to Ken Smukler, his longtime political consultant. "You have to talk to Kenny," Brady said. "They did all that. That's five years ago. I don't remember none of that." Asked if his campaign sent Moore's campaign $90,000 to pay debts, Brady said: "Whatever they did, I don't know." Lawyers for Smukler and Brady insisted both men had done nothing wrong. Moore did not respond to requests for comment. Cavaness, the 34-year-old pastor of Bethel African Methodist Episcopal Church in Ardmore, had worked as a deputy finance director in the New York office of then-Sen. Hillary Clinton's 2008 run for president before Cavaness landed on Moore's campaign. The unsealed records show she admitted during a brief hearing in federal court Friday that in 2012 she helped funnel the $90,000 from Brady's political action committee to Moore's campaign coffers after he ended his brief bid for Congress. According to her plea agreement, Moore instructed her to create a company whose sole purpose would be to receive funds from Brady's political campaign that could then be used to pay Moore's political debts. The payments were allegedly routed through two political consultants, who helped generate a paper trail to justify the payments from Brady's campaign. Prosecutors have not named those consultants, but a source familiar with the investigation identified them as Smukler and Don "D.A." Jones, another longtime Brady political staffer. Jones declined to comment Tuesday. In an interview, Smukler attorney Brian McMonagle said: "Ken Smukler has done nothing wrong and is completely innocent of any criminal wrongdoing." Cavaness pleaded guilty to causing false statements to the Federal Election Commission, because none of the payments was recorded in Moore's campaign-finance reports. It is unclear whether the deal Cavaness struck with prosecutors requires her to cooperate with investigators or testify against any potential co-conspirators. She could not be reached for comment Tuesday. Her lawyer, Anthony J. Petrone, said only: "My client admitted to her role in the offense. What others intend to do is up to them." It is also unclear why prosecutors waited five days to announce her guilty plea. But in court records, they did not mince words about why they had wanted to keep the records from public view until after her hearing: They said they feared Brady would try to interfere with the investigation. In a motion last month asking a judge to seal records regarding the plea deal, Assistant U.S. Attorney Eric Gibson warned of "a significant danger that [Brady], or others on his behalf, would attempt to contact [her] in a corrupt attempt to influence [her] decision." To justify his concern, Gibson detailed another scene that he said played out just days after FBI agents talked to Brady in April. The congressman, Gibson said, had approached another witness in the case and sought to sync their stories. Brady, the filings say, asked whether that unidentified person "was clear about what [had] happened" and stressed that he took care of Cavaness, whom he referred to as "Moore's girl" and had done nothing wrong. "The government submits that this conduct by [Brady] was intended to influence [that person's] account of the matter under investigation," the prosecutor wrote. In an interview late Tuesday, Brady's attorney, former federal prosecutor James Eisenhower, said Brady had been cooperating with investigators. "He has done nothing wrong," Eisenhower said. "He intends to continue to cooperate with them and maintain his innocence." Brady is by far the most experienced of Philadelphia's three U.S. House members. While still seen as a creature of Philadelphia much more than Washington, he also is a loyal ally of House Minority Leader Nancy Pelosi. He is the top Democrat on the House's administrative committee, which, among other things, oversees federal elections. Now in his 10th term in Congress, the former union leader rarely has faced formidable opposition at the polls. Moore was no exception. At the end of 2011, after Moore's campaign was underway, he reported having $3,977 in the bank, federal campaign-finance reports showed, and he had poured tens of thousands of dollars of his own money into the campaign. At the same time, Brady reported $758,355 on hand for the race. When he dropped out of the race three months later, Moore released a joint statement with Brady saying his decision reflected "an effort to unify the Philadelphia Democratic Party. " Brady in turn praised the decision as "selfless" and pledged to "support Judge Moore in the future." Florence Farinella, the widow of Brady's former campaign treasurer, Louis Farinella Jr., said Tuesday that FBI agents had visited their house in April, demanding to enter. "They served him papers there. They're a–holes," Florence Farinella said. "He could barely talk, his lungs were so bad." Louis Farinella died April 28 of renal failure, she said. Asked if her husband ever mentioned the FBI investigation, Florence Farinella said: "Whatever happened with that, I have no idea. My husband and Bob [Brady] said the less I know, the better off I am. In case it goes any further." Staff writers William Bender, Craig R. McCoy, and Jonathan Tamari contributed to this article.